An ISO 9001-2000 certified multi-specialty hospital offering a patient-centric care to people of all age groups. Fully equipped to offer medical assistance for all kinds of emergencies including pediatrics (facilities for Children). Our diverse team of 100+ Doctors, including physicians and clinicians, share a common passion to prove the highest quality of care. Our fully trained, knowledgeable, and humble team of staff is always ready to provide the best possible support. Located in the heart of the city, the hospital is easily accessible easily accessible by both car and public transport. We believe that treatment does not have to be expensive to be effective and so we offer the best treatment to all sections of society. We want you to be happy and healthy, that’s why we’re here. We are a leading integrated healthcare center in Lucknow dedicated to providing Accessible, Accountable and Affordable healthcare services of the highest quality to all sections of society. The cornerstones of Midland’s legacy are its unstinting focus on clinical excellence, affordable costs, technologically advanced equipment and a forward-looking approach towards training & research. 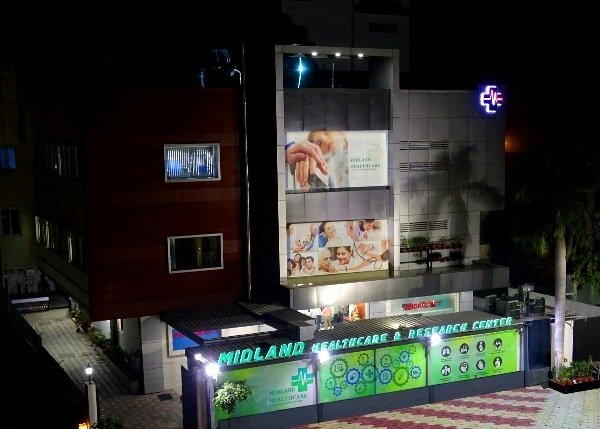 Midland Healthcare & Research Center is an ISO 9001-2000 certified multi-specialty hospital known to provide accessible, accountable and affordable health care services to all sections of the society. We are one of the pioneer private hospitals in the city and are known for our quality work since the time of inception. Being centrally located, the hospital is easily accessible from all parts of the state. The cornerstones of Midland’s legacy are its unstinting focus on clinical excellence, affordable costs, technologically advanced equipment and a forward-looking approach towards training & research. We are well equipped to offer a patient-centric care to everyone from Neonates to pediatric and adults. Know more about us here. Good. Would recommend it. I visited for skin treatment. Excellent hospital with supportive staff and highly experienced doctors. Hospital staff are quite supportive and nothing to ask about doctor Dr B.P Singh. The best doctor I have ever met till date. Hospital is very nice with good facility, staff, and Experienced Doctors. Hospital's New services like Lab packages, Home collection service, and medicine home delivery system is very good and unique. All over the best hospital in Mahanagar location to facilitate Lucknow peoples with best services. Well reputed center. They genuinely care for their patients. I would definitely recommend this hospital to my dear ones. Midland healthcare has a very good infrastructure and best doctors in the city. My mother was admitted there for a minor gallbladder surgery in May. Since it was a laparoscopic surgery, she was discharged in no time and the surgery was quite affordable too! I am very thankful that doctors did their best to not just cure her but also ensured that the post-operative care is good. One of the best hospitals with very supportive staff and management in Mahanagar area. The doctors and experienced caring and effective. One of the best place in the city for treatment of respiratory issues. The infrastructure is also up to the mark, nice tidy and spacious building makes the place better. A few months back, while coming back from work on my bike after a late night shift, I met with an accident. Few people on the road took me to Midland Hospital because I was bleeding from my head and couldn’t move my left leg at all. The Emergency department immediately swung into action, first conducting an X-ray and CT scan to check for any lasting damage. Thankfully, there were no internal damages on my head but my left was fractured. Stayed in the hospital a couple of days and was greatly satisfied with the quality of treatment and support I received there. I have had various experiences with hospitals but the Emergency department in Midland healthcare is one of the best. One of my relatives was referred to Midland Healthcare, I found the staff were rushed off their feet and yet dealt courteously and comprehensively throughout his stay and the whole treatment and surgery was cost friendly. I would like to thank Dr. B.P. Singh and his brilliant team. Good facility and management. Treatment is cost friendly. Excellent place for treatment of respiratory. Outstanding approach to overall treatment managed by Dr. B P Singh. Well known hospital & nice staff. Midland Hospital is the best hospital in Lucknow. It is best in cleanness, the staff is supportive and they offer the best treatment under the guidance of Dr. B P Singh.